In talking with others who have participated in VCLA, I’ve consistently heard two things. First, I’ve been told that VCLA is an incredible journey full of eye-opening experiences and opportunities to form lifelong friendships. Second, I’ve been told that each session brings an overwhelming onslaught of information. So far, I have found both of these sentiments to be remarkably true. However, despite the fast pace and significant amount of information encompassed in session one, a few consistent themes about leadership did start to become much clearer for me. Before session one, I don’t think I’d ever given much conscious thought to what a leader looks like, or where they come from, or what personality traits they exhibit. Although, I think part of me had always felt you needed a title, like president or CEO, to be a leader. And I think I also assumed that leaders had to be born with a certain amount of charisma (a potentially discouraging thought, since I can be a bit on the shy side). But session one gave me the opportunity to reflect a little deeper. All of us in Cohort XXIII are leaders, or at least aspiring leaders. And through the “Two Steps Forward” activity — as we all stepped forward or backward in response to how we had been affected by a broad range of challenges and circumstances — it became apparent that leaders come from all walks of life. And from Genevieve Evans-Taylor’s presentation on leadership later in the day, it became equally clear, much to my delight, that neither title nor innate charisma is a prerequisite for leadership. But as Genevieve Evans-Taylor’s presentation pointed out, leadership isn’t about knowing everything — we are all teachers, and we are all learners. Strong leaders share their wisdom as they lead by example while also empowering others to share their own knowledge and strengths. 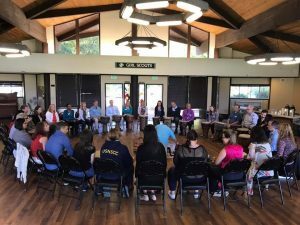 As we listened to each other’s immersion activity reports and learned about each other’s backgrounds, I was surprised to discover just how many different organizations — public, private and nonprofit — all contribute to the overall well-being of Ventura County. And if there was one thing the afternoon’s State of the Region report revealed, it was that all of the challenges facing our county are interconnected in one way or another. It is by working together, with each other and with those they lead, that Ventura County’s leaders can help the region achieve its fullest potential. It has only been one session, and I already feel my horizons broadening. I can’t wait to see what new discoveries session two will bring! Nerissa Stacey is a communications strategist at Mustang Marketing, a full-service marketing, advertising and communications firm that has served organizations throughout Southern California since 1986. Her responsibilities include copywriting and editing, as well as assisting in the development and implementation of marketing and public relations strategies for Mustang’s clients. 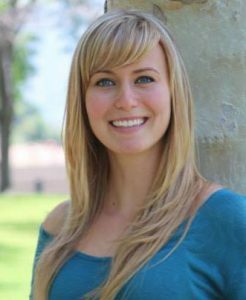 She is a California Lutheran University graduate and has been a Ventura County resident since she was four years old. Beautiful summary of your inaugural day with VCLA. I am so glad you are part of the VCLA family! Thank you! And sorry I didn’t see this until just now. I am so glad to be a part of the VCLA family. Thank you for all you did to help make it such a wonderful, eye-opening experience.